MANILA, Philippines – (UPDATED) For the second consecutive game, it looked as though Ateneo de Manila University was about to waste a double-digit advantage against De La Salle University in the UAAP Season 80 finals. This time around, however, the Blue Eagles proved to have enough in the tank to battle past the Green Archers and emerge as the champions of the men's basketball tournament. In a remarkably well-fought game that featured seven deadlocks and seven lead changes, the Blue Eagles fended off the Green Archers, 88-86, in the do-or-die Game 3 of the best-of-three finals to dethrone their rivals and annex the UAAP crown. 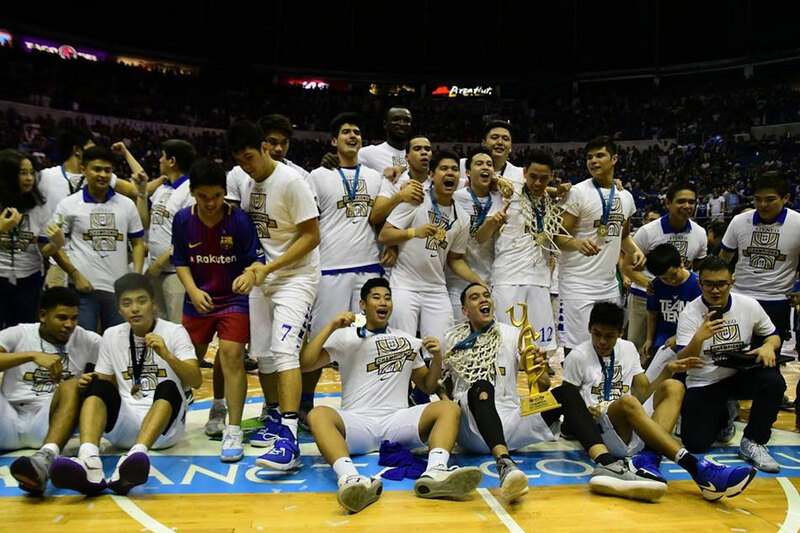 It was Ateneo's first UAAP title since Season 75, when they won the last of five consecutive championships. A sellout crowd of 22,012 fans watched at the Araneta Coliseum on Sunday as the Blue Eagles surged to an early 10-point lead at the end of the first frame, only for the Green Arches to claw their way back again as they did in Game 2 of the series. By the end of the third period, the two squads were back to square one as they were knotted up at 66-all. There, the execution and hard work that abandoned the Blue Eagles in their Game 2 meltdown came to their rescue. Offensive rebounds by Thirdy Ravena and Chibueze Ikeh led to booming triples by Matt Nieto and Anton Asistio, respectively. Those three-point bombs touched off a 14-2 run that turned a slim 68-66 deficit into a 10-point lead, 80-70, with just 4:06 to play as the Blue Eagles appeared ready to run away with the crown. Yet as they did in Game 2, La Salle showed that they had no intention of relinquishing the crown that easily. A triple by Aljun Melecio touched off a 10-2 run for the defending champions, with reigning MVP Ben Mbala coming through with a three-point play, and Andrei Caracut knocking down the triple that made it a two-point game, 82-80, with still 48.9 seconds left to play. There was no panic shown by Ateneo, however. Out of a timeout, they put the ball in the hands of Ravena, who ran a picture-perfect pick-and-roll with Isaac Go. The big man, as he has time and again this season, found himself open from beyond the arc. And just as he did against Far Eastern University in the Final 4, Go did not hesitate in letting it fly. His shot hit nothing but net, giving the Blue Eagles an 85-80 cushion with 24.7 seconds left to play. Out of a timeout, La Salle tried to go to Mbala but the Cameroonian star lost the ball, and Ateneo's Ikeh forced a jump ball with the possession heading to the Blue Eagles. That led to a split at the line for Asistio that made it 86-80, and La Salle halved that lead when Melecio drilled a triple with 5.6 seconds to go. But Matt Nieto coolly knocked down a pair of clutch free throws with 4.3 seconds left, and while Andrei Caracut's triple at the buzzer counted, it had no impact on the final score as the Blue Eagles celebrated at the Big Dome. Ravena finished with 17 points, eight rebounds, five assists and three steals, en route to winning Finals MVP honors – an award that his celebrated older brother, Kiefer, never won in his own stellar collegiate career. Nieto, Ateneo's hard-working point guard, had 14 points, while Ikeh tallied 12 points and 13 rebounds and heard the Ateneo gallery chant his name at the end of the contest. Asistio contributed 11 points, while Go scored seven points – including the dagger – in just 12 minutes off action. Mbala, the two-time MVP, had 19 points and 14 rebounds for the Green Archers, while Melecio finished with 16 points. Ricci Rivero, one of the heroes in La Salle's Game 2 win, had 14 points, and Caracut finished with 13 markers. However, outside of Mbala, the Green Archers struggled with their shooting. As a team, La Salle shot 40.51% from the field, but they allowed the Blue Eagles to convert 42.67% of their own shots. They also failed to find their mark from beyond the arc, making only eight of 33 three-pointers. La Salle worked their way back in the game in the second quarter due to their hard work on the glass, and indeed they finished with 30 second-chance points. However, they were beaten to the ball by Ateneo in crucial possessions in the fourth frame, allowing the Blue Eagles to build a cushion that was safe even against the explosive Green Archers. This was Ateneo's ninth UAAP crown overall, and first since 2012. ATENEO 88 — Ravena 17, Ma. Nieto 14, Ikeh 12, Asistio 11, Tolentino 9, Go 7, Verano 6, Mendoza 5, Black 4, Mamuyac 3, Mi. Nieto 0. LA SALLE 86 — Mbala 19, Melecio 16, R. Rivero 14, Caracut 13, Santillan 11, Tratter 4, Go 3, Montalbo 3, P. Rivero 2, Tero 1, Baltazar 0.